The Federal Aviation Administration (FAA) has announced plans to establish within the next year a Center of Excellence (COE) for its Unmanned Aircraft Systems (UAS) Research, Engineering, and Development Program. An FAA notice published last Friday (March 28, 2014) said that the agency will launch a competitive search for a team to lead the initiative as part of the FAA’s effort to integrate UAS into the National Airspace System (NAS). A draft solicitation will be available on or before April 18. The FAA will hold a meeting May 28–29 in the Washington, D.C., area — at a time and date yet to be announced — to discuss COE and UAS technical requirements with prospective applicants who want to lead the initiative. 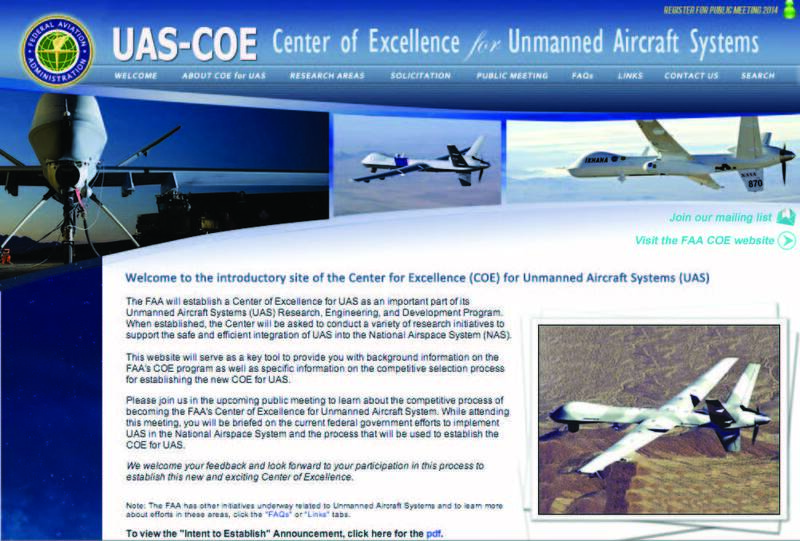 According to the FAA notice, the COE will be a geographically disbursed consortium of the FAA, university partners, and their affiliates selected by the agency to conduct UAS-related research, education, and training “while working jointly on issues of mutual interest and concern.” The FAA will initially issue cooperative agreements to the selected university team members and specific projects defined and funded through matching grants over the life of the COE. The successful COE applicant will conduct research to assist the FAA fill some of the gaps in its roadmap to integrate UAS into the NAS. The FAA says it needs to identify and develop criteria and standards required for the civil certification of UAS pilots, equipment, and operations. 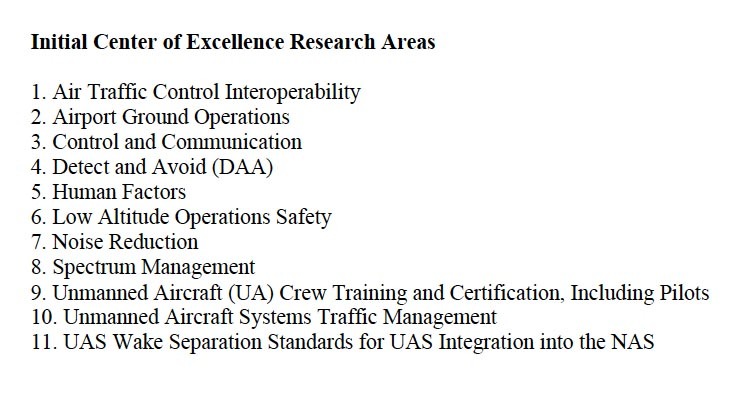 Nine focus research areas have been identified that represent examples of the challenges that need to be addressed: air traffic control interoperability, airport ground operations, command and control (C2), detect and avoid (DAA), human factors, system performance, privacy practices for UAS operations, system engineering, unmanned aircraft pilot training and certification. The FAA anticipates that the COE will attract organizations, such as industrial groups and other public and private entities, interested in collaborating with and coordinating the research and related activities. These organizations may be considered as affiliate members by the COE core universities and may provide matching contributions and receive funding from the COE. The UAS in the NAS initiative is part of the legislative mandate in the 2012 FAA Modernization and Reform Act. Late last year the FAA selected six operators for unmanned aircraft test sites as a key element in the program. Additional UAS information and registration details for the public meeting are available at the COE UAS website: <https://faa-uas-coe.net>.